Accomplishment: Three cheers for everyone who made it through! Books: I have a long list of new books to read. Comments: Leaving them and reading them is integral to the experience. Deadlines: Six posts a week = a lot of deadlines. Enough: Not enough time in a day. Followers: Also a big part of the experience. Gamers: I had no idea there were so many game blogs. Honesty: So many tales truthfully told. International: The blogging community is truly a global one. Jewelry: I wish I had your talents, beaders. Kind: Every single comment I read was positive. Laughs: I always appreciate a daily dose of humor. Men vs. women: I think women accounted for more blogs, but I might be wrong. Planning ahead: An excellent strategy. Query letters: Good luck to everyone trying to master them. Including me. Recognition: There are a whole bunch of nice blog awards circulating. Surprise Me! : I love that blog-surfing button. Thank you to everyone who visited The Writing Bug! Unique: Every blog is different. Isn’t that great? Voice: Wise, poignant, funny, irreverent…again, each one is unique. Writers: Even if you don’t consider yourself a writer, blogging means you are one. X posts: Tricky letter X resulted in some of the most creative posts of the month. YA, romance, sci-fi, fantasy, mystery…genres were well-represented. Zzzzz: Now, a well-earned rest for all the hard-working bloggers. A big thanks to Arlee Bird and the other hosts of the challenge! 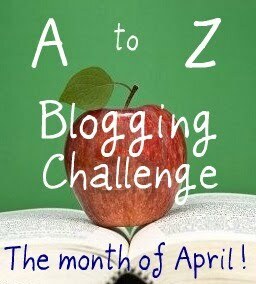 Visit Arlee’s blog, Tossing it Out, to find the blogs participating in the A to Z Challenge Reflections Mega Post. What are your thoughts on A to Z? Such a clever A-Z list! I'm happy to have participated, but also very happy to go back to my regular blogging schedule! Hey this is awesome! What a super cool encore to the monthly challenge! I htink you're right about there being more women than men. I'm not going to lie, some of those letters were tricky and I only had a few. It was a great challenge though and fun to read the other bloggers. Even though I didn't participate, I enjoyed the chance to read new blogs I would never had heard of without the challenge. My thoughts is that clicking on the A-to-Z widget brought in contact with some very interesting blogs I might otherwise not have seen. Thanks, everyone. I'm glad to know that your experiences with A to Z were positive! I really like this post, and I'm linking to it in my own post tomorrow. Well done. Sewa, thanks for stopping by. Pat, thanks for the link! Clever recap for an envjoyable blogging experience!